A part of the roof area has been developed accessible and invite you to linger. The plaza is generous and open while the 50 stores that were placed around are rather pushed more in the background. Already after a few weeks a green carpet covered the roof landscape. One of the entrances to the center, flanked with green areas. The ZinCo Georaster®-elements applied over the full surface provides reinforcement for the subsequently applied substrate layer. On the Asian side of Istanbul in the suburb “Ümraniye” adjacent to an “IKEA-market” which was already opened in May 2005 a future-oriented shopping center of the Metro Group Asset Management (MAM) was opened in August 2007, after only about two years of construction. The new shopping center “Meydan”, which in Turkish means "marketplace" or "meeting point", according to the client stands for a completely new concept in shopping malls. As the „first shopping square of the world“, according to MAM, the new building with its open architecture is designed to invite to shop and linger. The innovation of this concept is that a total of 50 shops, restaurants and cafes are structured into five “theme worlds” located around the central plaza. Thus, visitors will find the shops and entertainment areas combined and quickly accessible via stairs and ramps, and not spread over an in total 70.000 m² large building complex. The unusual architecture combined with specific technology is also new to the shopping center “Meydan”. Created as natural meadows and partially accessible roof areas, smooth transitions between the different building structures and one of the largest geothermal plants in Europe with more than 200 drillings up to 150 m deep, which allows for the climate-friendly heating and cooling of the Meydan Shopping Center make it an innovative retail development which is unparalleled. A shopping center as a “green oasis” with opportunities to play, walk and picnic surrounded by a district dominated by concrete buildings was the concept of the London architects of Foreign Office Architects (FOA). With this concept they had prevailed in a four-day workshop with five internationally renowned teams of architects in 2005. The shopping-center reminds one of the original look of the emerging district while at the same time setting forward-looking accents. 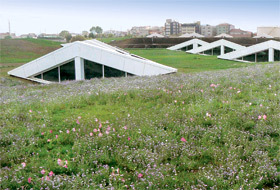 The roof landscape, for example, covered with grasses and herbs represents a throwback into the past of today's booming district of “Ümraniye” because this was until a few decades ago still a rural suburb with about 900 inhabitants. In recent years the number rose to 650.000 inhabitants and in addition, many international companies have located here to benefit from the favorable location at the crossroads of the main arteries between the Asian and the European part of the city. The architecture of the shopping square functions as a public space in the middle of the sprawling sea of buildings in the district. 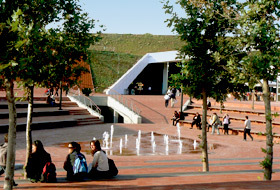 The urban design concept takes up the existing and expected pedestrian access routes of residents into the area. 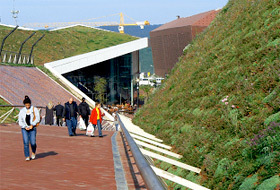 The concept leads people over green sloping roofs to the center of the shopping complex. “Meydan” is aimed at all generations of Istanbul but is especially attractive to the younger ones, who make up about 50% of the population. In addition to the anchor stores “Media Markt“ and “Real“ there is a fashion and sports world, numerous service shops, a large cinema complex and a versatile food-court. Meydan Shopping Center already became a meeting place of the city. On a busy weekend it attracts more than 50.000 visitors. To achieve the natural vegetation that was desired by the architects on the folded and sometimes very steep sloped roof surfaces represented a special challenge. Because of the variety of roof situations and different usages – 16.000 m² flat roof not accessible, 1.250 m² flat roof accessible, 11.900 m² sloped roof up to approx. 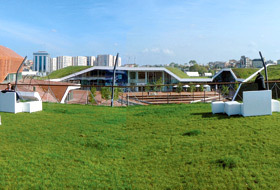 25° pitched und 1.500 m² steep pitched roof up to more than 35° – four different green roof systems were used by the system manufacturer ZinCo. The installation from March to August of 2007 was carried out by ZinCo’s Turkish partner Onduline Avrasya AS. 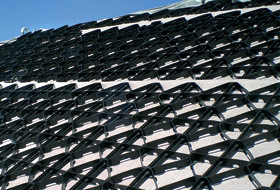 The roof construction – consisting of trapezoidal sheets with thermal insulation made of expanded polystyrene foam – was waterproofed with a root-resistant, single-layer membrane that also came from a German production (Rhepanol of FDT FlachdachTechnologie GmbH & Co. KG), so that directly after installation of the necessary shear barriers in the steep roof areas the green roof installation could be started. The protection mats, drainage elements of the types Floradrain® und Floraset®, system filters as well as the Georaster®-elements for the steep roof areas have been delivered previously from Germany, while the approx. 3.300 m³ extensive and intensive substrate used in the project has been mixed in Turkey according to ZinCo Specification, and has been analyzed regularly for its suitability. Staff at ZinCo’s engineering department, which even worked out the recipe for the grass mixture, as well as the responsible Export Manager Mr. Karl-Heinz Braun, who had to take over, at times, construction management tasks in Istanbul, showed a total commitment to the task here. Finally, the effort was worth it. The vegetation has grown rapidly and established well, also due to the integrated irrigation system in the green roof build-up. The amount of water has been reduced more and more over time to accustom the vegetation to a certain stress level.